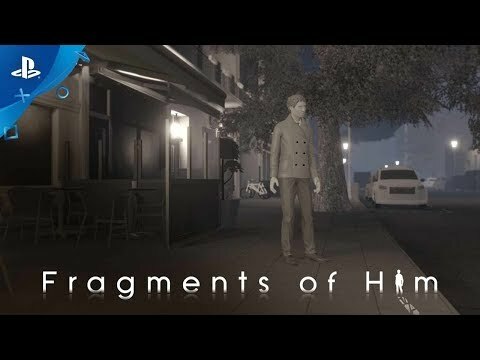 Fragments of Him is a narrative-driven video game about love, memories, and hope. The lives of friends, family, and loved ones. Players travel alongside four characters, learning about their lives through their regrets and treasured moments. We see Will's final morning and gain insight into his last thoughts before an accident cuts his life short, and join his loved ones Mary (his grandmother), Sarah (his ex), and Harry (his partner) as they come to terms with their loss. Fragments of Him is a drama dealing with real emotions that all of us will have to face someday. It is a journey filled with both tears and happiness, and ultimately has a heart-warming message: cherish those you love and the time you have with them. Play through moments of each character's lives using simple controls. View the game through a unique "out of body" position experienced from a first-person perspective. The story of Fragments of Him centers around Will, a bright young man in a relationship with Harry. Harry is Will's partner and together they are hopeful about their future. Sarah is Will's ex-girlfriend, a relationship that sprouted and developed during their time together at the University of Winchester. As a child, Will grew up around his grandmother Mary who loves him greatly, despite her traditional upbringing and conservative views. Together they will go through the undeniable eventuality of prematurely losing someone you love.